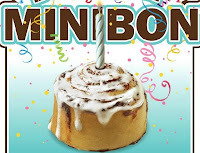 Free Minibon from Cinnabon Coupon! Head over to Cinnabon's Faceabook page to print out a coupon good for a FREE Minibon! You can find the "Click to Print" button in the upper right corner. Coupon is valid on 9/25/12 only and can only be redeemed at mall-based Cinnabon stores.